Kawasaki disease (KD) is an acute vasculitis of unknown cause, predominantly affecting infants and young children. Prompt diagnosis and treatment of KD within ten days of illness is critical as delayed diagnosis and treatment significantly increases the risk of coronary artery aneurysms (CAA). We report a case of six month old Hispanic male who developed giant CAA after a late diagnosis of KD and died suddenly due to extensive coronary artery thrombosis. A six-month-old Hispanic male presented to the ER with seven-day history of fever, cough and congestion and he was treated with antibiotics for possible pneumonia. Two days later due to persistent fevers, irritability and gastrointestinal symptoms, he was admitted for septic work up. He was continued on antibiotics for possible urinary tract infection and aseptic meningitis (had elevated white cell counts in the urine and CSF). He continued to have recurrent fevers, and seventeen days into the illness he was noted to have increasing white cell count (29.5 K mm 3 ), high platelet count (1061 K mm 3 ), elevated CRP (138 mg/L), high ESR (>100 mm/hr) with mild peeling of his fingertips which prompted an echocardiogram. He had a transient conjunctivitis, dry lips and skin rash early in the course of his illness by history but had a normal exam at presentation. 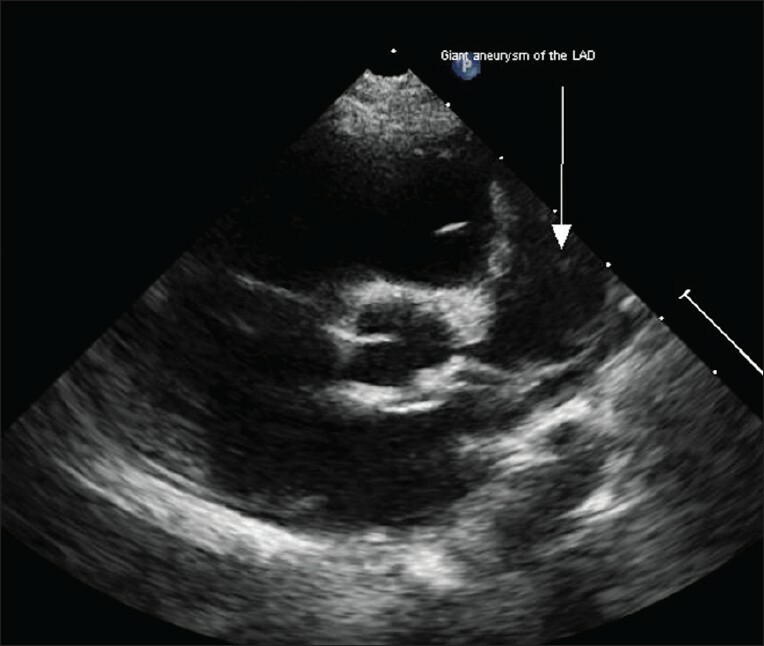 Echocardiogram showed extensive, multiple, giant CAA of the right coronary artery (RCA), fusiform shape, the largest measuring 19 m × 20 mm [Figure 1], the proximal left anterior descending artery (LAD) measuring 22 mm × 24 mm [Figure 2], [Video 1] and [Video 2]. He had a large pericardial effusion, which was drained. He was treated with IVIG and Abciximab. Due to risk of coronary artery thrombus and for myocardial protection, he was treated with enoxaparin, Clopidogrel, Aspirin, Captopril, and Propranolol, which were continued at the time of discharge. He was closely followed up as outpatient with serial echocardiograms. At his last follow up four months later, he was doing well, with stable giant CAA with no thrombus and normal biventricular function by echocardiography. A cardiac catheterization was planned in next 1-2 months. A month later he presented to the ER with nonspecific gastrointestinal symptoms and irritability, he was presumed to have a viral illness, and was discharged. The next day he died suddenly at home. Autopsy showed giant fusiform CAA of the RCA measuring 20 mm in diameter and 65 mm in length with occluding thrombus [Figure 3]. 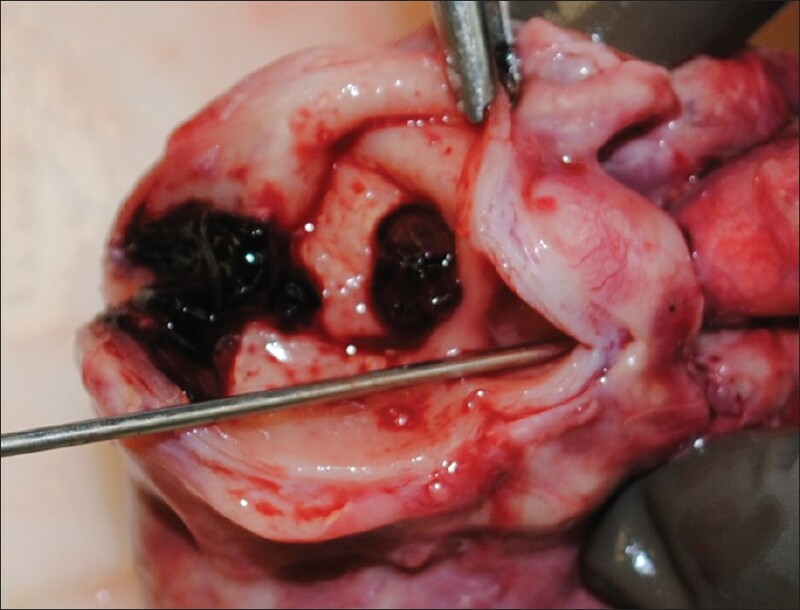 The giant LAD aneurysm was oval and measured 20 mm in diameter and 40 mm in length with occluding thrombus [Figure 4]. The myocardium showed multifocal grayish scar formation particularly of the inter-ventricular septum suggestive of infarction. Microscopic cross section showed a completely occluding mural thrombus in RCA aneurysm with intimal wall thickening. Giant CAA has the highest risk for thrombosis as seen in our patient. , In a long term follow up study; giant CAA progressed to stenosis in 46% of patients, and of these stenotic lesions, 67% developed myocardial infarction (MI) within three years. The highest risk for MI is in the first year after diagnosis. Sluggish flow within the aneurysms in addition to stenosis at the proximal and distal ends of aneurysms predisposes to thrombosis. Despite maximal medical anticoagulation therapy, unfortunately our patient developed extensive coronary artery thrombosis nearly five months after diagnosis, which resulted in myocardial infarction and sudden death. 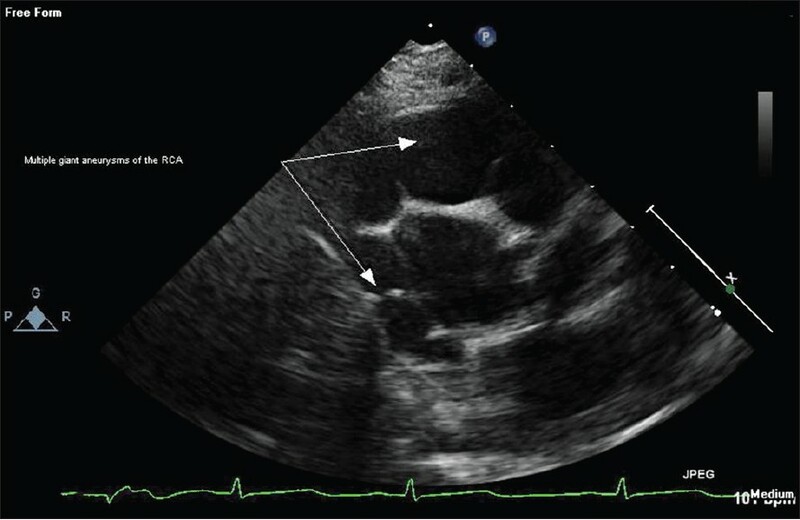 This case further highlights that when infants with giant CAA present with irritability and nonspecific GI symptoms, a high index of suspicion and appropriate testing for coronary ischemia or myocardial infarction is necessary. In conclusion, infants with giant CAA are at risk for thrombosis resulting in ischemia, myocardial infarction, and sudden death, and these patients require careful follow up. Dr. Choi Chai, the medical examiner in Oklahoma City, for providing the autopsy photographs. Dr. Geetha Umakumaran for help with the manuscript. 1. Newburger JW, Takahashi M, Gerber MA, Gewitz MH, Tani LY, Burns JC, et al. Diagnosis, treatment, and long-term management of Kawasaki disease: A statement for health professionals from the committee on rheumatic fever, endocarditis and Kawasaki disease, council on cardiovascular disease in the young, american heart association. Circulation 2004;110:2747-71. 2. Patil S, Shirodkar S, Pinto RJ, Dalvi B. 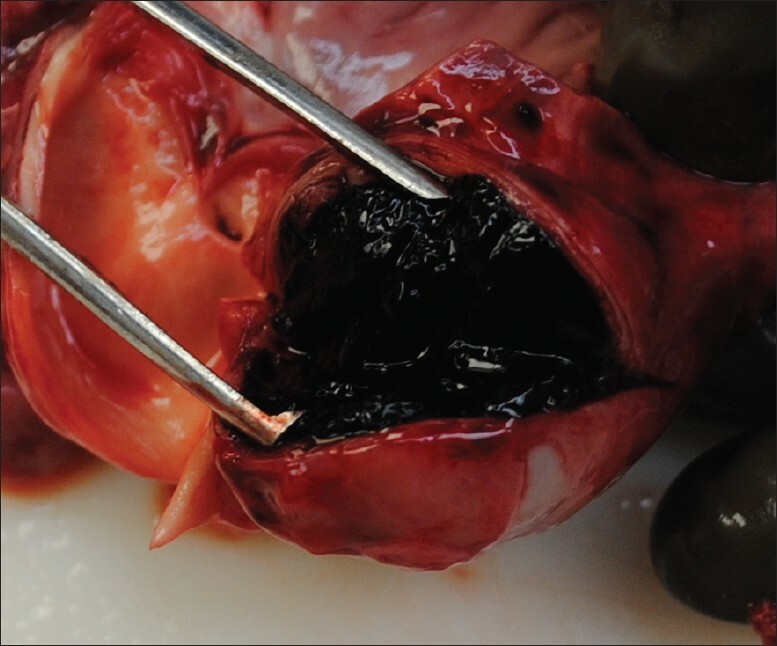 Giant coronary artery aneurysm with a thrombus secondary to Kawasaki disease. Ann Pediatr Cardiol 2008;1:59-61. 3. Kato H, Sugimura T, Akagi T, Sato N, Hashino K, Maeno Y, et al. Long-term consequences of Kawasaki disease. A 10- to 21-year follow-up study of 594 patients. Circulation 1996;94:1379-85. 4. Chang FY, Hwang B, Chen SJ, Lee PC, Meng CC, Lu JH. Characteristics of Kawasaki disease in infants younger than six months of age. Pediatr Infect Dis J, 2006;25:241-4. 5. Liu HC, Lo CW, Hwang B, Lee PC. Clinical manifestations vary with different age spectrums in infants with Kawasaki disease. Scientific World Journal 2012;2012:210382. 6. Minich LL, Sleeper LA, Atz AM, McCrindle BW, Lu M, et al. Delayed diagnosis of Kawasaki disease: What are the risk factors? Pediatrics 2007;120:1434-40. 7. Anderson MS, Todd JK, Glode MP. Delayed diagnosis of Kawasaki syndrome: An analysis of the problem. Pediatrics, 2005;115:428-33. 8. Belay ED, Maddox RA, Holman RC, Curns AT, Ballah K, Schonberger LB. Kawasaki syndrome and risk factors for coronary artery abnormalities: United States, 1994-2003. Pediatr Infect Dis J 2006;25:245-9. 9. Nakamura Y, Yashiro M, Uehara R, Watanabe M, Tajimi M, Oki I, et al. Case-control study of giant coronary aneurysms due to Kawasaki disease. Pediatr Int 2003;45:410-3. 10. McCrindle BW, Li JS, Minich LL, Colan SD, Atz AM, Takahashi M, et al. Coronary artery involvement in children with Kawasaki disease: Risk factors from analysis of serial normalized measurements. Circulation 2007;116:174-9.